Check out our floor plans with loft space large enough for a 2nd bedroom! Experience the fun and convenience of living in Downtown Phoenix in an apartment, loft, or townhome at Camden Copper Square. 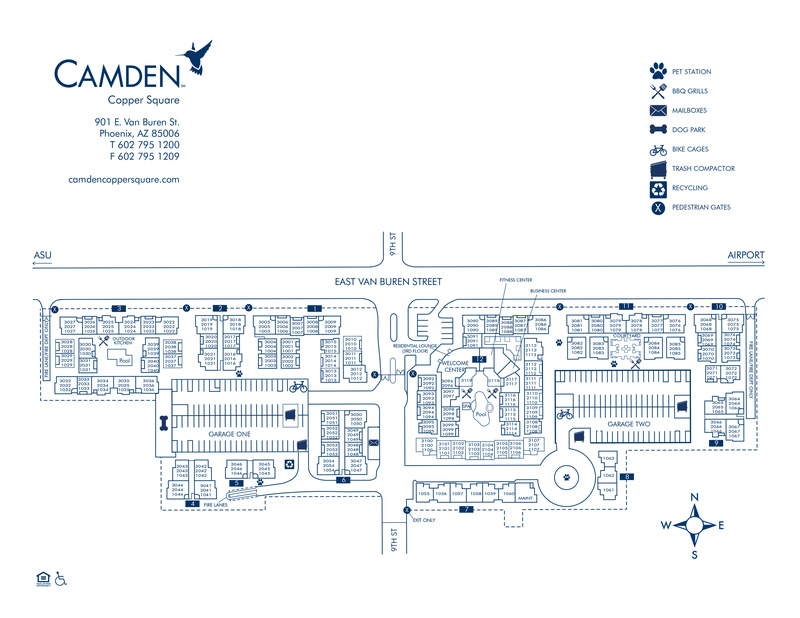 Each studio, one, or two bedroom floor plan at Camden Copper Square has classic finishes in an open-concept layout. The gourmet kitchens feature granite or laminate countertops, black and stainless steel appliances, and plenty of storage space within cherry-finished cabinets. Whether you’re looking for a quiet retreat or space to entertain, enjoy seamless flow from the living room to the dining space bathed in natural light from large windows – the perfect spot to showcase the Downtown Phoenix skyline as well. Additional details inside Camden Copper Square’s apartments include large walk-in closets with custom shelving, full-size washer and dryers inside every home, plank-wood flooring, large garden tubs, and 9-foot ceilings framed with crown molding. Change up the usual fitness routine. Drop your costly gym membership and take advantage of the cardio equipment, free weights, resistance training machines and more in our 24-hour fitness center. Soak in the beautiful Arizona sun. Choose from two heated pools with outdoor kitchen areas, perfect for entertaining. Catch up with good friends. Find plenty of comfortable seats with spectacular downtown views in our outdoor resident lounge. Skip the long commute. The 24-hour resident lounge with complimentary Wi-Fi is the perfect space to work or study. Did we mention free gourmet coffee 24x7? Let your dog run free. At Camden Copper Square we love dogs and cats. There are no weight limits on pets and we have a private, off-leash dog park. Keep your car cool all year long. Park conveniently on your floor in the complimentary garage with controlled access. Don’t just daydream - take a virtual tour of our Downtown Phoenix apartments. Located in Downtown Phoenix, Camden Copper Square puts you within walking distance to the light rail, Arizona Center for shopping, dining and entertainment, Heritage Square that hosts year-round, family friendly events for the community, and Chase Field to catch a Diamondbacks game. Our apartment community is also just minutes from The University of Arizona College of Medicine - Phoenix and Arizona State University Downtown Phoenix. Need help while exploring downtown? Look for a Downtown Phoenix Ambassador in their signature orange and khaki uniforms. Positioned south of the I10 FWY, Camden Copper Square is only a short drive from anywhere you need to be in the Phoenix Metro area. A ten-minute drive also takes you to Sky Harbor International Airport which makes catching a flight or picking up your friends and family a breeze. The good life in Downtown Phoenix is waiting for you. Lease with Camden Copper Square today! We'll save a spot for you! We offer first-come, first-serve parking in our 4-story parking garage and offer visitor parking as well. Parking for residents is $25 per vehicle. Some apartment homes also have garages included!